Sitting at your desk all day can lead to back problems, especially if you have bad posture. There are some things you can do to help relieve the aches and pains associated with prolonged sitting. When sitting at your desk, what is your posture like? Do you slouch over while you work? Sitting straight is very important, as is having back support. 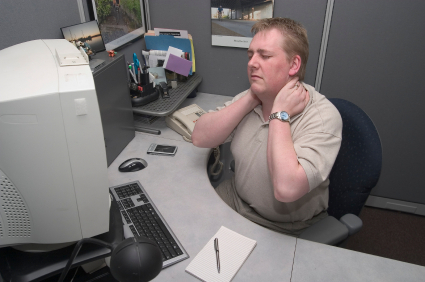 Your shoulder blades, lower and mid back should all make contact with the upright support of your office chair. Your office chair should have a back rest, and the height should be adjusted so that your desk surface is elbow high. Your keyboard should be close to you to prevent you hunching over and your computer monitor should be at your eye level. Gentle exercise is good for your back, getting up from your desk and stretching can help alleviate the pain and stiffness. Going for a walk at lunch or break times will also help. Look into getting an ergonomic chair that is suited to you, as you spend eight hours or more at your desk it will be worth the investment. You could also try using a lumbar roll to support your lower back. This entry was posted on Monday, June 7th, 2010 at 11:14 am	and is filed under Office Health, Uncategorized. You can follow any responses to this entry through the RSS 2.0 feed. You can leave a response, or trackback from your own site.